Pfizer’s football-themed campaign to raise awareness of ankylosing spondylitis has picked up one of a brace of awards for the company at the EMEA Sabres. The company’s work with Ogilvy Health PR on Back In Play took the Public Education award, and it shared the Marketing To Men award with communications partner the Red Consultancy for ManMOT. 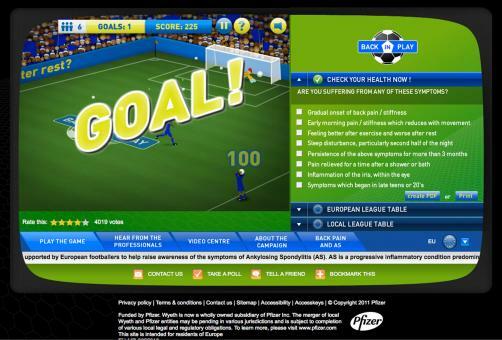 Launched in 2010, the European Back In Play campaign centres on a football game that tests a player’s throw-in skills to highlight the symptoms of ankylosing spondylitis. Visitors to the site can also watch a throw-in master class from Stoke City player, and former Irish international, Rory Delap, review a symptom checklist compiled by the Ankylosing Spondylitis International Federation, find out more information about the condition through patient and doctor interviews and explore links to patient support groups. The initiative taps into a trend within pharma to introduce gaming into the marketing mix - last year also saw games for various formats from Bayer, Novartis Vaccines, Boehringer Ingelheim and Shire – the latter also having a football theme. Meanwhile Pfizer’s UK online male health clinic ManMOT also picked up a going at the EMEA Sabres in the Specialist Audience – Marketing To Men category. ManMOT was launched last summer to offer men confidential advice and information about any health problem and is the UK’s first online health surgery for men. Now in their seventh year the EMEA Sabre Awards are run by US-based publication the Holmes Report. Other winners at this year’s event in Prague included Abbott Laboratories with Weber Shandwick for the Fit for Work Europe (Pan-European Programme category) and Allergan with Chandler Chicco Agency for work around the approval of Botox’s chronic migraine indication (Healthcare – Pharmaceuticals). There were also awards in the Social Media/Social Networking and Marketing To Youth categories for Cancer Research UK with Unity for Skindividual. This offered young music fans the chance to organise their own events as part of the campaign’s work to raise awareness of skin cancer. Dominic Tyer is web editor for Pharmafocus and InPharm.com and the author of the Digital Pharma blog He can be contacted via email, Twitter or LinkedIn.